Gifts make feel special everyone. And when you give a gift to your mother you become closer to your best person in the world. We can say that by exchanging gifts we will build a bridge of love, care, and share. Mother is the most important and loves the person in our life. We also feel good if our mother will happy to have a gift from us. But it is a big question and sometimes a big problem for us that what should we gift mother. Mother is a special person in our life so her gift also should be special. Don’t get hassled. Here I gonna give some amazing, easy and appropriate gift ideas for mother. 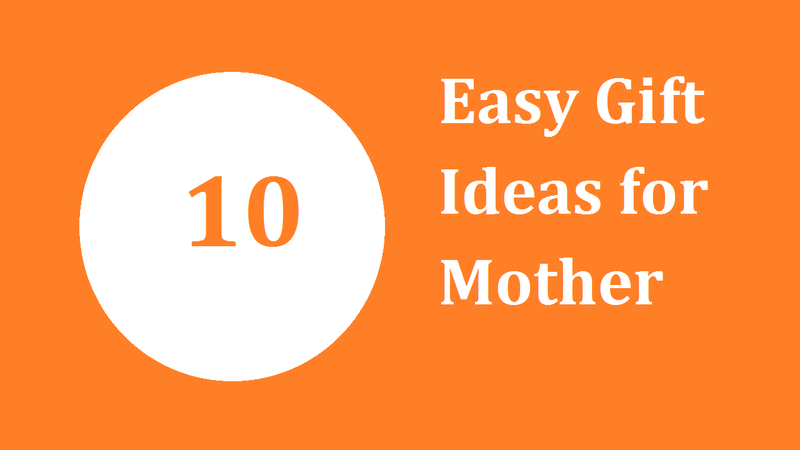 Though I have a lot of ideas now I am going to describe you about 10 easy gift ideas for mother. It is the easiest, wonderful, precious and best gift ever for mother from her children. Nowadays we all are busy with our busy day and don’t get time to talk spontaneously and beyond time. Mother misses their children’s company. Do you really want to make your mother happy? Find out some time to spend only with her. Take her for shopping, have lunch or dinner together in a café or restaurant. Take attempt to make her smile. She would feel better and happy much than other materialistic gifts ever. Does your mother love to read the book? If the answer is yes, the book will get first priority in gifts list for your mother. A book lover will happy to have books as gifts. It is so easy to gift idea for mother. But you have to know about your mother’s favorite writers or which genre’s book she love to read. Most of the mothers are love to cook. So there is an easy option for you to make your mother happy and surprised. If you know recently which kitchen instrument is in bucket list of your mother for buy? If you don’t know anything for worry, ask her which instrument is absent in her kitchen. Know that and buy it for her. She would love this gift idea. All the women love dresses. So it is an amazing and easy gift idea for mother. Do you have any idea which brand, the color you mother prefer to wear? If you don’t know ask your sister or your aunty. They may help you. Your mother would love this gift. You can gift her wrist watch from her preferred brand. It is so smart idea of gift for mother. Try to choose any fancy wrist watch. You can gift her antic one also. Nowadays it is so good idea of the gift for mother. Usually, mothers are used to spending money for her children and family. It is commonly seen they use a normal mobile but she bought an expensive and modern mobile for her children. If you gift her good mobile she becomes so happy. This gift will give her idea that you care her. This is such an easy but effective gift idea for mother. She becomes very happy if you make a cake for her. Learn the recipe from youtube or someone else. Make a cake and give her surprise. You can write “best mom”, “love you mom” or something whatever you love to write on the cake. You can gift makeup kits to your mother. Say me whose women do not love to do makeup? Just pick some preferable makeup kits for your mother and rapping that nicely. Put it on your mother’s bag or keep it on your mother’ dressing table. She becomes so happy and surprised when she finds out this. This is so incredible gift idea for mother. If you are able to buy a furniture, you can think about to buy a furniture for her. It will be a good gift idea for your mother. Usually, our moms are loves to buy furniture. Just find out what your mother recently think and want to buy. This is so easy idea of the gifts for mother. You can make a card for your mother. You can do it any occasion or casually. Your mother would love your effort indeed. It doesn’t matter how your card looks like, only your effort matter. Write some kind, lovely and special words for her. This gonna make her happiest mom. Mothers are always concern about you. It is not so tough to make her happy with some easy and simple gift ideas. You can apply these easy ideas of gift for mother.